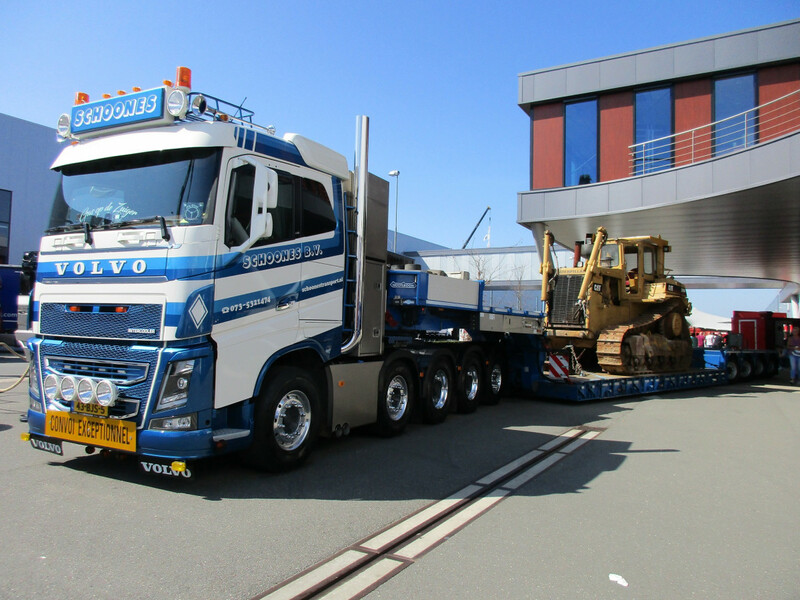 Here’s the third and last of the Volvo-Nooteboom couples, which seems to be a perfect marriage in the world of heavy haulage. 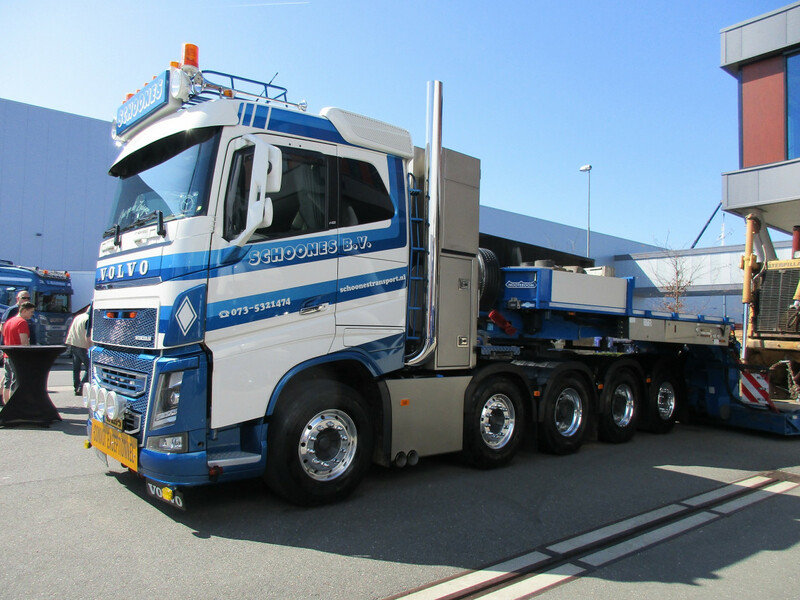 The Schoones company brought their fairly new 2017 combination to the show, a 750 hp Volvo FH16 10×4 tractor with a Nooteboom Euro-83-04 low loader. Currently, this is the most powerful and heaviest on-highway tractor that money can buy. It’s powered by Volvo’s 16.1 liter inline-6 engine, originally introduced in 1987. Thanks to its multiple steering axles (the first, second and fifth axle), the white & blue mastodon is still highly maneuverable. With Volvo’s I-Shift automatic transmission and crawler gears, the truck maker guarantees that driving away from a standstill position with a GVM up to 325 metric tons (716,500 lbs) goes flawlessly. 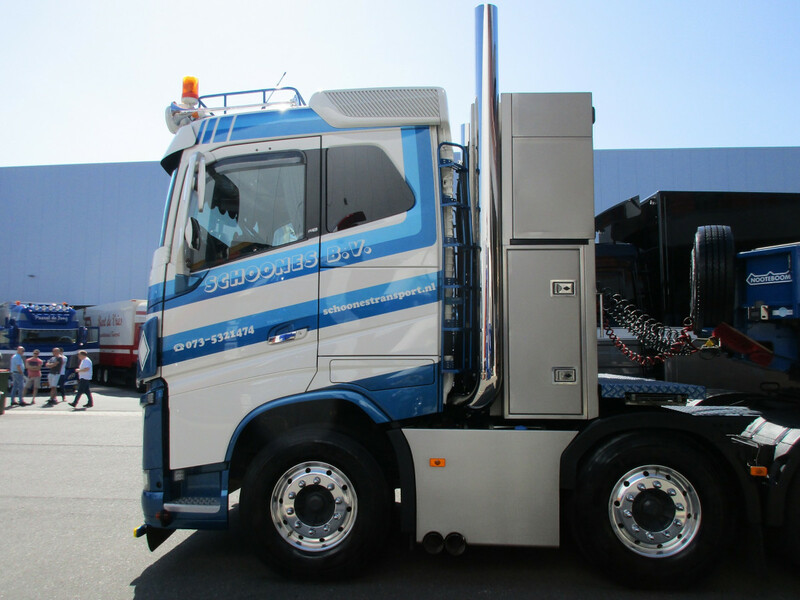 The only serious alternatives to a Volvo FH16 in this line of business come from Scania, Mercedes-Benz and MAN. Almost all independent specialized manufacturers, like FTF, are long gone. A custom-built, stainless steel storage cabinet, how nice. Certainly not available at your local IKEA store. De Sjouwert, it says at the top. That’s one hard-working guy! (and tractor). A cab with a standard (low) roof is quite special these days in this top segment of Euro-trucking. 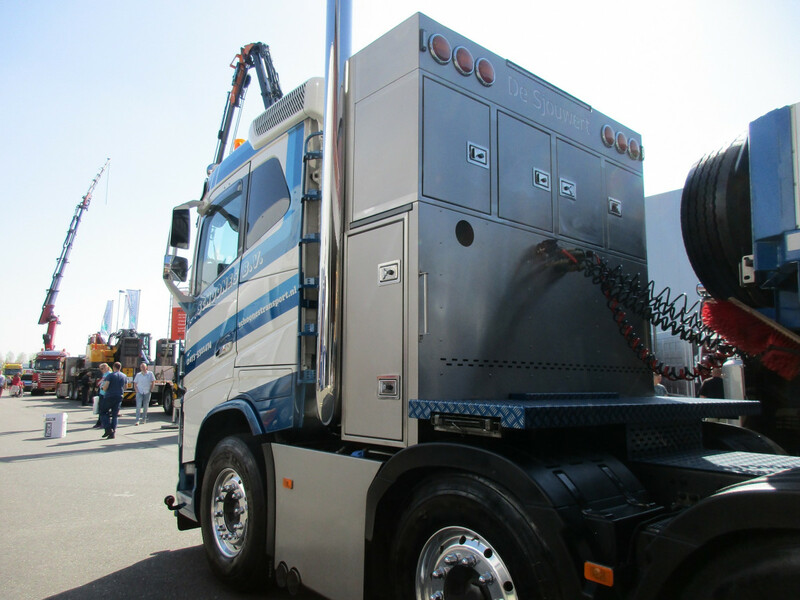 Most Volvo FH-series trucks and tractors have a tall Globetrotter cab, or an even taller Globetrotter XL cab. 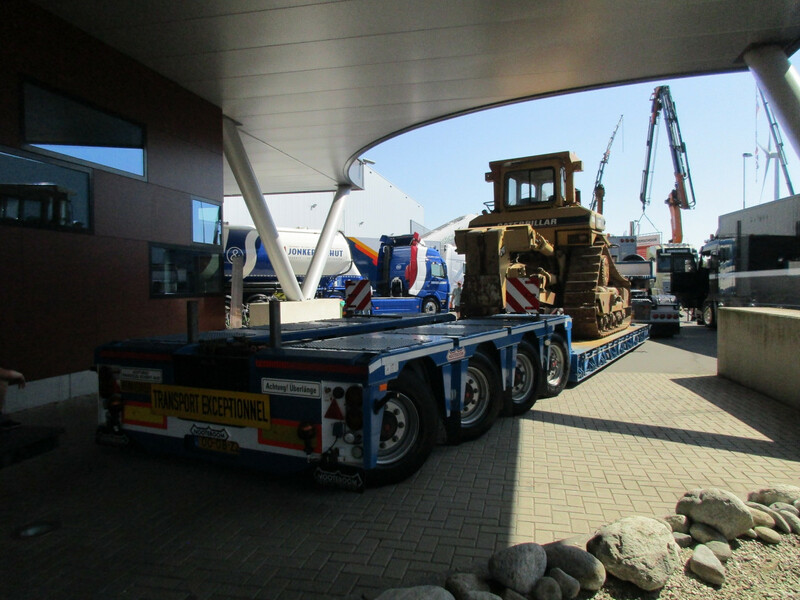 The Nooteboom low loader is rated at a maximum GVM of 83,000 kg, with a payload capacity of 58,650 kg (183,000 and 129,300 lbs respectively). 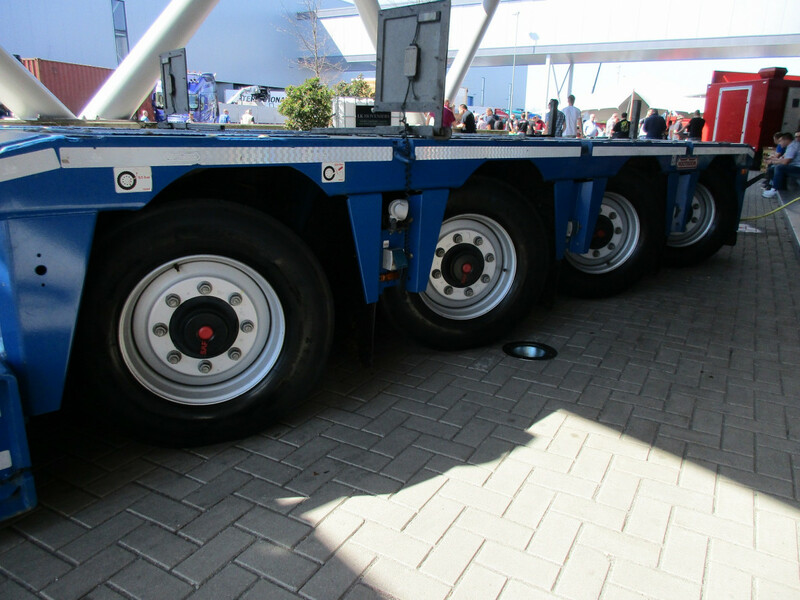 Trailer and semi-trailer manufacturer Nooteboom uses SAF -like here- or BPW axles. The small sticker on the left says that the recommended tire pressure is 9.5 bar (138 psi). Don’t try this at home! And here’s another venerable sjouwert, a Caterpillar D8N crawler tractor, usually equipped with a big dozer blade at the front. The D8N was introduced in 1987, it was replaced by the D8R in 1996. Ed, our man in the field, can tell you everything you want to know about this Big Yellow Machine. Or is he hauling hay as we speak? Fantastic looking combination. Just a word or two on the cabinet on the back of the tractor: Not sure what these are called in English, the German word for them (“Schwerlastturm”) translates to heavy cargo tower, but I’ve also seen them being referred to as equipment towers or cooling towers. This one keeps its contents close to its heart, but the more exposed ones, especially on older heavy haul tractors, serve as a nice display of what’s commonly contained in them. Due to the extra wheels eating up all the lower real estate, these towers were primarily designed to house relocated or additional air or hydraulic pressure tanks, fuel tanks, pumps and other gadgets as well as in the heaviest haul cases even additional transmission oil coolers, and of course tool cabinets. I doubt that this one is made up purely of storage, it’s probably hiding some tanks and stuff on the inside. On another note: Macks in the US and more importantly in Australian road trains now have the mDrive transmission available, which is precisely a rebadged Volvo I-Shift, in addition to modern Mack engines being rebadged Volvo units anyway, and I’m wondering if any Australians can say a few words on how they’ve been received on the Australian market. Interesting that the fuel and air tanks are built into what we call a “headache rack” here in the US. Makes sense if your frame rails are fully populated with axles. In North America a tractor spec’d for this job would be a conventional with a single steer axle. Most of the oversize/heavy haul guys like Petes, KWs and Macks in that order. Headache racks are usually put on the trailer here. I’ve noticed that US heavy haul trucks are more likely to just have double or at the very most triple rear axles and then distribute the load across various dollies and stingers. In Europe on the other hand we try to stay with a single trailer as much as possible for purposes of reverse maneuverability, even to the point of having steerable axles across the entire length of the trailer. I thought about this series last night as I saw a very euro like car hauler that apparently does private transport, that I probably should have took a picture of. Rather than the semi trailers we typically see in the US this was a straight truck with a frame long enough that a car can sit on the truck. The trailer was a drawbar unit with a very long drawbar. It was sitting in a parking lot waiting for the person to pickup his late model Shelby Mustang. That car was in the preferred semi-enclosed spot on the truck. So it was seriously jack-knifed with a set of ramps set up and waiting to unload. The trailer was also unusual in that it had an upper rack instead of an upper deck. The rack is apparently dropped to the deck, the cars driven on and then a beam is placed just in front of and just behind each wheel forming a cradle for the tire to sink down into. Presumably they are locked in place somehow and then the rack is lifted. Loading/unloading at the front side of the bed. Very heavy low loaders often roll down the road with an interdolly placed between the front side of the bed and the gooseneck. Watch the video I posted in Part 1 (first link at the bottom of the article), that will clear things up. About the car hauler. Typically something like the combination below is used to bring cars to dealerships etc. : a 4×2 straight truck towing a tandem trailer. They come in all sizes (like a light truck carrying one car plus a tandem trailer, also carrying one car). 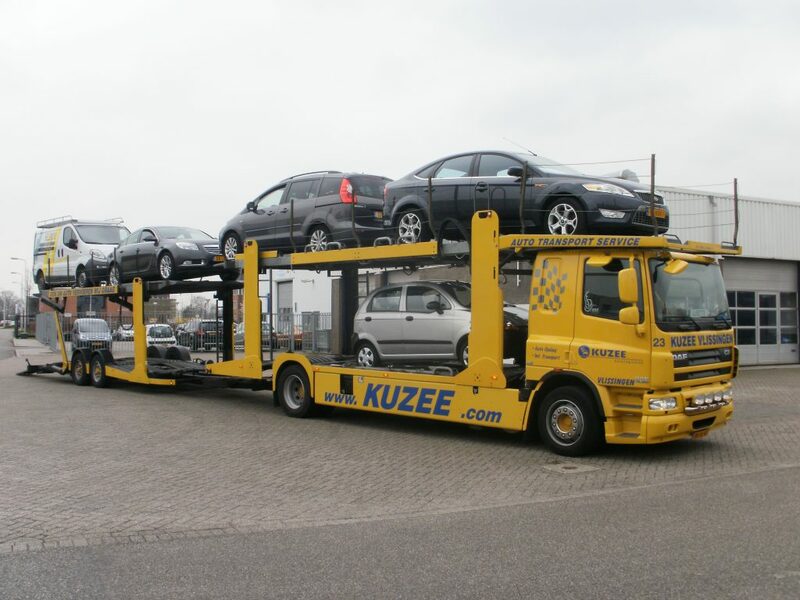 Those same DAF based car haulers are used here, a common sight on our roads they use a 460hp engine, cars are not very heavy for the volume they take up. Yeah cars are a full-on volume load. 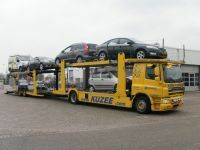 There’s actually an exception in German road laws specifically for car haulers that states these can be 20,75 m long including all overhangs (1.50 m rear, 0.5 m front at a height of 2.50 m or greater), whereas all other trucks with drawbar trailers can only be 20,00 m long including all overhangs. Semi trailer combinations must be even shorter (13,60 m trailer length plus 1,50 m rear overhang), that’s why you’ll never ever in your life see a semi trailer car hauler in Germany. Aren’t the biggest Euro car transporters built by Lohr from France? Funny you should mention hay, as I cut my field just a couple days ago. Anyone want to come help bale this weekend? The D8 size class actually goes back to 1935 with the RD8 making 132 HP from a straight-six diesel engine and weighing 34,000 lb. 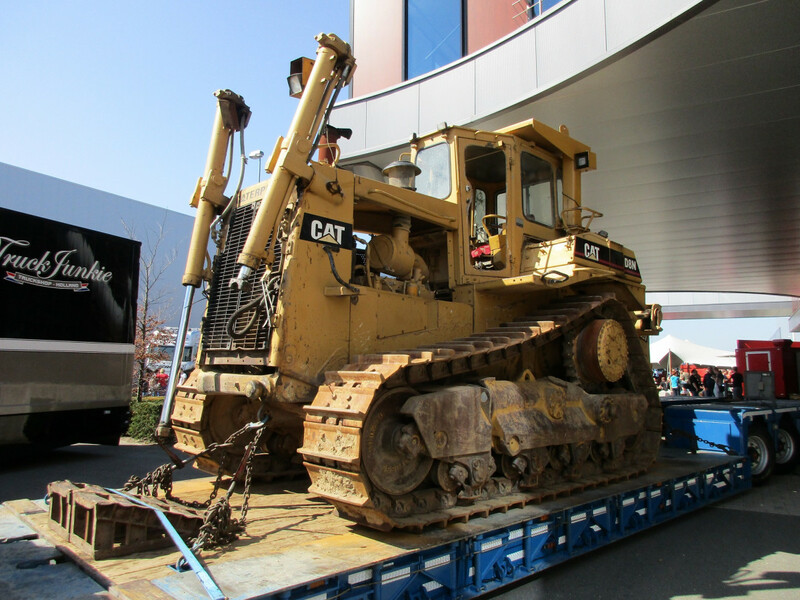 The D8N made 285 HP and was the first Cat track-type tractor to offer differential steering (“diff-steer”). The currently-produced D8R makes 305 HP and weighs 83,271 lb., and is sold into regions with lower emissions regulations. The D8T makes 310 HP at 1,850 rpm from an EU Stage IIIa/Tier 3 engine and weighs 84,850 lb. 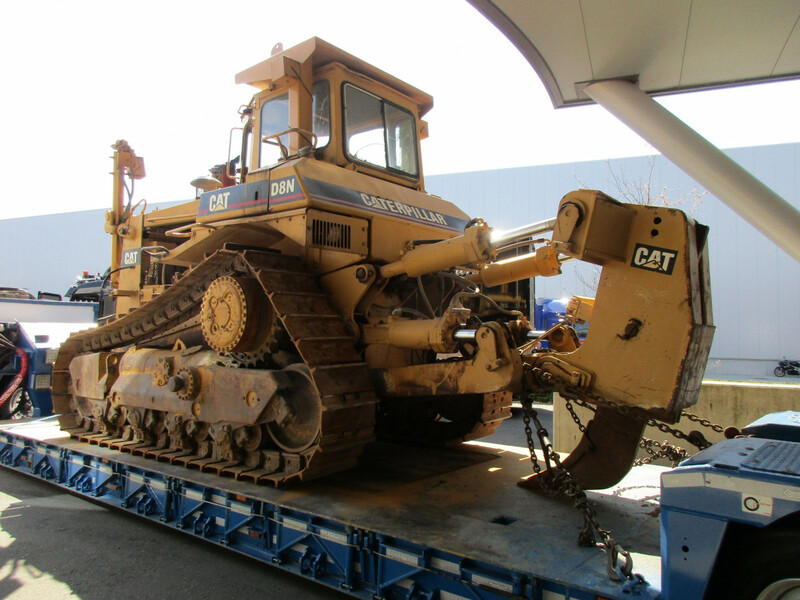 The elevated sprocket undercarriage design was first used on the Cat D10*, introduced in 1977, and was first used on a D8 size tractor in 1982 with the D8L. 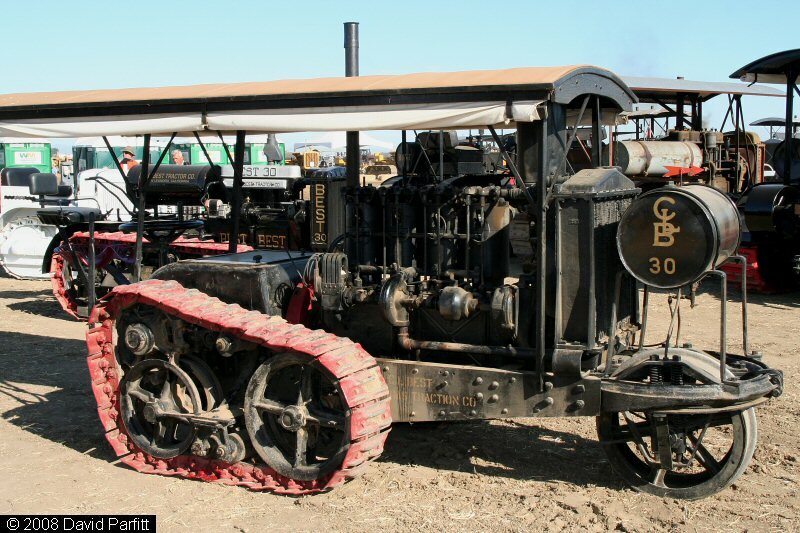 *The elevated sprocket idea actually goes back to the 1914 C. L. Best Model 30 “Humpback” – Best and Holt would merge to form Caterpillar in 1925. Funny you should mention hay, too, as hay haulers seem to be the last bastion of large cabovers in the US, at least the western US. Mostly Freightliners,as well as a number of the old Peterbilt 362’s. Still see a few hauling grain here in the Middle West, too. I still must have this book about US rigs, bought somewhere in the nineties. Written by the late Stan Holtzman, IIRC. 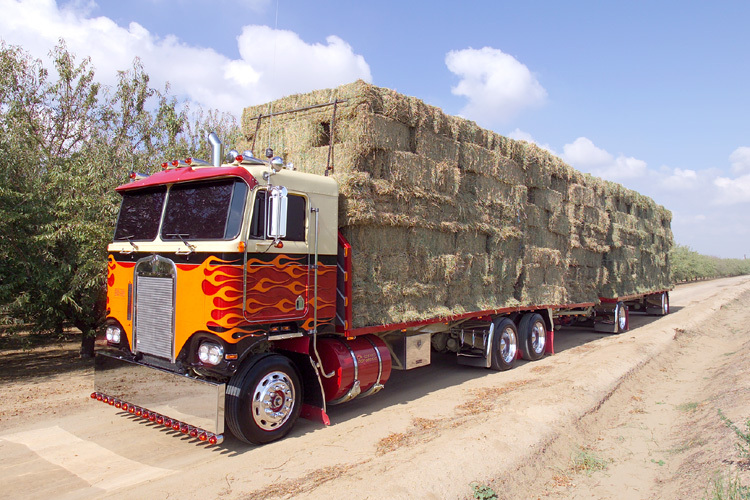 There was a whole chapter, with many pictures, dedicated to these Western hay haulers. Something like the one below (photo courtesy of 10-4 Magazine). I shift is actually an automated version of the 12 speed Volvo manual box and its a good system the shift programming works well on our steep hills, Mack uses the same powertrain now its part of Volvo. Volvo powertrain components are also used in Renault trucks and tractors, all very logical of course. No idea if you have those heavy Renaults in NZ/Australia. The big 16 liter engine was also offered by Mack, in their Titan model. Not anymore, the top dog power unit is now exclusively Volvo.